Whether you’re unhappy about your energy expenses, the future or both, installing photovoltaic panels reduces your monthly electricity expenses and usage. In addition, improvements in efficiency and technology combined with government and municipal incentives make photovoltaic power cheaper for everyone! So the time is right for photovoltaic electricity! Every week, Solaron is helping El Dorado Hills clients learn more about how photovoltaic power will work for them. Although there are numerous different companies of photovoltaic panels, Solaron is happy to be an Authorized Dealer for SunPower. Compared with other mass manufactured models, SunPower photovoltaic panels convert the biggest percentage of sunlight into power, up to 44% more per square foot than competitors. SunPower controls the entire assembly process, generating the market’s highest quality, best-looking photovoltaic panels. 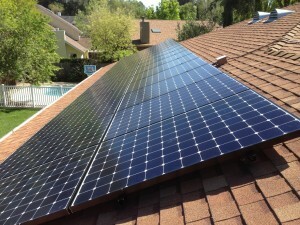 In addition, SunPower panels come with a 25-year efficiency warranty. A leading product installed by a reliable company is a winning combo!